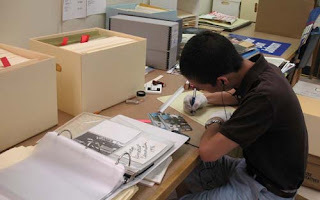 Now that we have taken some actions (a la Step 1: Identify) to gain a better understanding of what we want to move, we can begin focusing on the creation of accurate inventories and catalog records for the collections. But before we get into this, let’s backup and talk about our new storage area. One important thing to know about the new special collections building: all of our collections will be kept in a space that we lovingly refer to as “the cube.” The building will be 115,000 square feet total, but our climate controlled, high density storage area will take up approximately 30,000 of those feet. Most of the storage space will be kept at the optimal environmental conditions for documents (which comprise the vast majority of our holdings) with a small portion devoted to conditions that accommodate objects containing natural materials which cannot be exposed to extremely low temperatures (cold) and humidity levels (dry); some examples would be pieces of furniture and paintings. We estimate that the entire new storage area should accommodate the holdings of all three special collections libraries, leaving room to enough to grow for at least the next forty years. Currently we have catalog records and finding aids for 124 of our 300 collections. For the other collections, without full finding aids, we have preliminary finding aids and general box listings. We are beginning the process of finalizing our preliminary finding aids in order to create catalog records for all of our holdings. We have students double checking container inventories that already exist. And, we are gathering information about containers that are not currently available in our finding aids database. We are planning a full item level inventory of our more valuable items that will be stored in the upstairs vault. The UGA Libraries Cataloging Department has been gracious enough to catalog Senator Russell’s book collection. 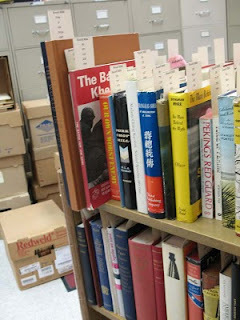 The project is almost complete and they have cataloged over 2,500 titles. 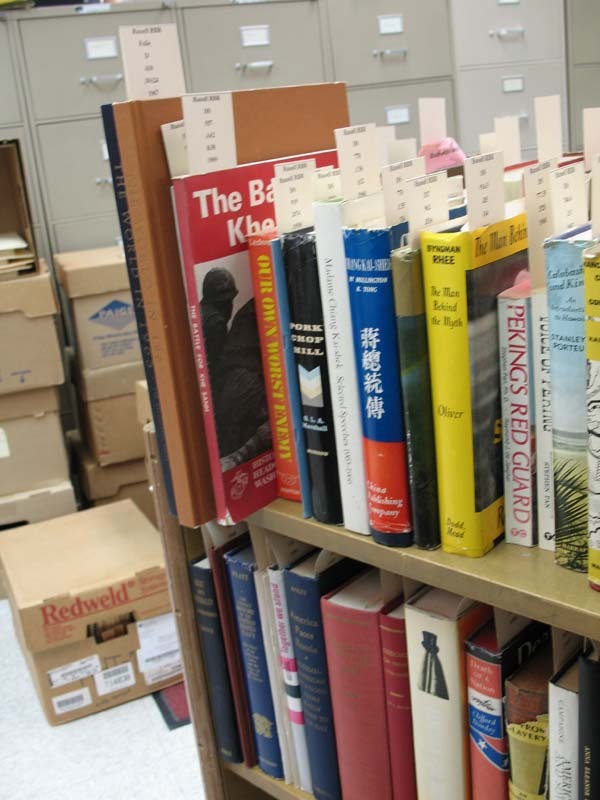 There are other book collections in our holdings, but none are as large as the Senator’s so we will worry about having the others cataloged at a later date. Over the next few months we will create finding aids and catalog records for all of our smaller collections (those less than 10 linear feet) and preliminary inventories for larger collections. Also, we will create a list of holdings that have user restrictions and are not available to researchers; these collections will receive very minimal catalog records (consisting only of a brief description and box listing). Hopefully by July 2011 we will have at least minimal records for all of our holdings here at the Main Library and then we can move on to our off-site facilities.